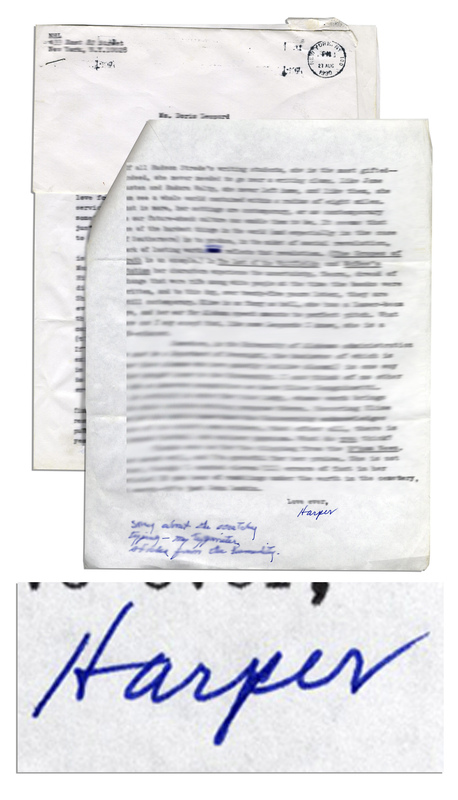 Harper Lee typed letter signed, dated 25 August 1990, with exceptional content, written in the same affectionate and lyrical style as "To Kill a Mockingbird". Lee specifically writes about novels dealing with social revolution, mentioning John Steinbeck’s "The Grapes of Wrath” and speaking with great admiration about Alabama novelist Elise Sanguinetti’s novels "Whitfields: The New Girl" & "McBee’s Station” - comparing Sanguinetti to Jane Austen and Eudora Welty. Lee writes a note below in blue pen, apologizing for the quality of her typewriter. 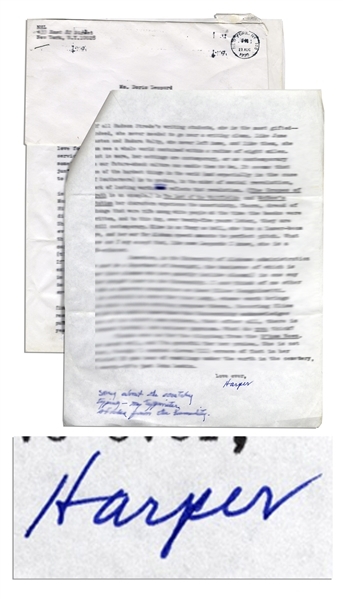 Two page 8.5" x 11" letter is in fine condition stapled to the original envelope, postmarked from New York. Auction closed on Thursday, March 31, 2016.